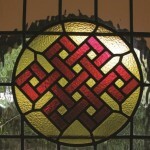 MARPA HOUSE was founded in 1973 by Lama Chime Rinpoche, a Tibetan meditation master of the Kagyü Tradition, and is now run by the Dharma Trust. The Kagyü or ‘oral tradition’, also known as the ‘practice lineage’, of Tibetan Buddhism teaches a system of meditation known as Mahamudra, first taught by Indian masters in the 11th century, including Tilopa and his disciple, Naropa, then two great Tibetan masters, Marpa and his disciple, Milarepa. This tradition of oral instruction, ripened by study and meditation practice, bearing the fruit of realisation which, in turn, is communicated from teacher to disciple, has continued up to the present day. 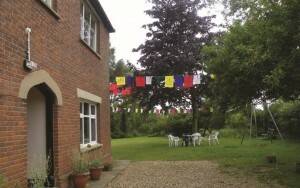 This is what is emphasised at Marpa House, although visitors of all traditions, or none, wishing to spend time in meditation and reflection within the environment offered by the House are welcome. 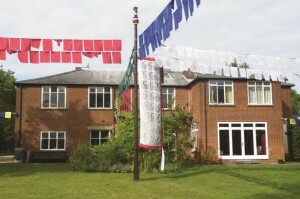 Marpa House is situated on the edge of Ashdon, a small village in rural Essex, and offers a tranquil environment for reflection, study and meditation practice. Visitors may come, by arrangement in advance, for a day or stay in the house, following our regular daily programme. 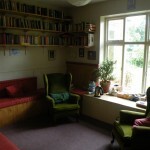 There is small library that guests may use during their stay and guidance in meditation practice is also available. Please contact us before visiting. You can come as a day visitor, or stay as a resident in the house, following our daily programme. You may also undertake a retreat. For special events, accommodation can book up quickly, so contact us early. During special events you can come as a day visitor, stay in the house, or stay in local accommodation in the village or towns in the district. Infants and children under 16 years old are welcome during designated family, or some special social, weekends. Residents and guests are asked to attend morning and evening Pujas; other sessions are optional. In the spirit of the basic precepts of Buddhism and to maintain an atmosphere conducive to meditation, guests are also expected to observe the House Guidelines, so the use of mobile phones, newspapers, music or radios is not permitted in the House and gossip is actively discouraged. The house has a shrine room, tea room/library, dining room, small shop, prostration room, along with several bedrooms of varying sizes. There is a large garden with an orchard area and vegetable plot. The house and gardens have a peaceful atmosphere enhanced by the regular daily Buddhist routine of shared meditation and pujas. The retreat wing consists of seven single residential rooms with a private garden for retreatants only, so, there is the opportunity for individual, quiet contemplation and Buddhist practice . 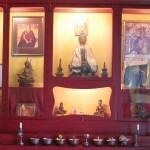 Periodically, teachings are given by Lama Chime Rinpoche, his students and by other visiting teachers. The first Sunday of most months is devoted to silent group meditation and many other events also take place. Details of these are included in our regular newsletter, website and emails. If you would like to receive these please contact the Secretary with your details. In the spirit of putting the teachings into practice, students can help financially, and/or by serving on the Committee and as Trustees. Those able to find time within busy lives may apply to live as a staff member, for up to a year, working within the discipline and guidelines of the House and practising meditation. Financial donations are also always welcome. A traditional routine is followed by all those staying, and working, in the house. For accommodation and meals, the current prices for staying at Marpa House are given below. 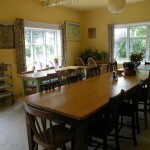 All prices include the use of all the facilities in the house and gardens, and three vegetarian meals per day. Weekly stays are charged at a reduced rate, and tariffs for longer stays can be agreed by arrangement with the secretary. PLEASE NOTE: All meals are vegetarian. Whilst we offer soya milk, dairy-free margarine, honey, rice cakes etc. as alternatives, and are sometimes able to be flexible, we cannot generally accommodate special diets.